My daughter and I did the easy class 3 scramble up Mt. 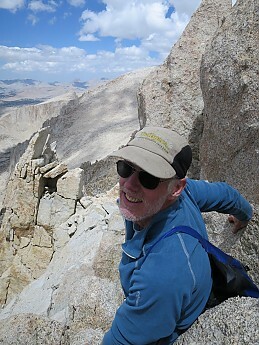 Muir on the way down from Whitney. Much less crowded. She took the picture on the way down. Nice! Looks like great weather too. I've heard there's been some pretty wild weather up there this summer. A colleague had to turn back from a summit hike due to snow and ice, and apparently there have been some epic thunder and hail storms. Great picture Richard! Thanks for sharing! Great picture! Looks like you had a great day for the summit.